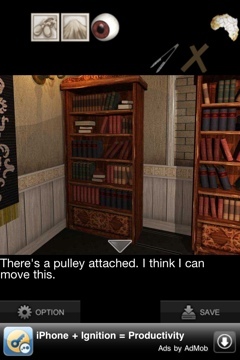 Looking for the Strange House II (2) walkthrough? 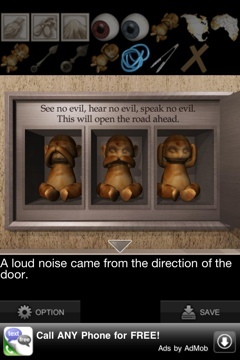 If you like this game, download AppNavi and enjoy IDAC escape games free of charge! Enter the ID eSvI to gain 100 bonus points for more games. **Note: Only read the walkthrough if you want the answers. If you just want a hint, post in the comments section and I’ll answer. 1. Lift up the hanging tapestry and take the “Mount Fuji” tile. 2. 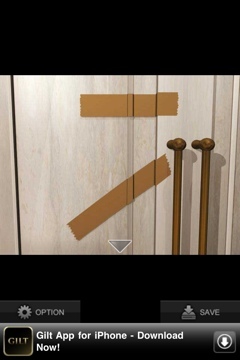 Zoom in on the white double-door and take off the tape. 3. Turn around to the table with the bowl of colored beads. Zoom in on the bowl and tape up the crack. 4. Look under the table for the “Eggplant” tile. 5. 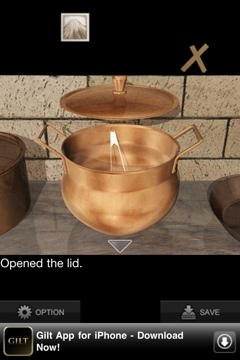 Open the pot above the fireplace and take the tongs. 6. 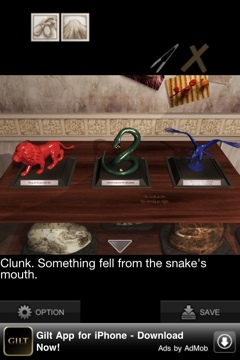 Move over to the table with the three animal figures. Make sure to zoom in on each one as much as pissible, then zoom in on the carving on the table. You need to move them in order from weakest (on the left) to strongest (on the right). 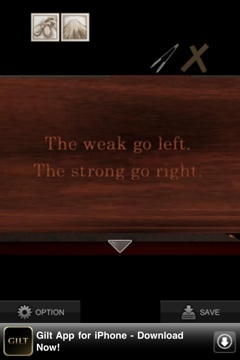 So move the lion left, then snake, then hawk. 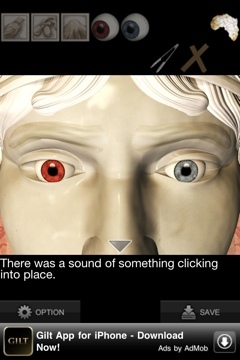 Then tap the snake again and the glass eye will drop out of its mouth. Take it. 8. 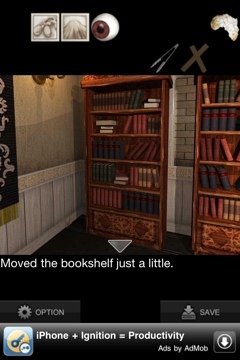 Tap the upper right corner of the right bookcase until you find a book that talks about Fuji, the Hawk, and Eggplants. This is the order they go in. Take them over to the screen door and open the panel. 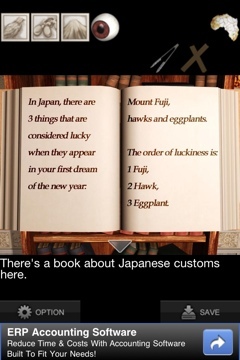 Place the three tiles in order: Mount Fuji, Hawk, Eggplant. Now you opened the entrance to get upstairs. But don’t go yet. We have more to do downstairs. 9. 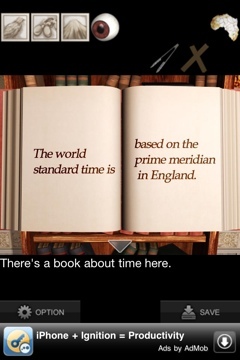 Go back to the right bookshelf and open the book that talks about the world standard time being based on England’s prime meridian. Then move back to the table with the animals and zoom in on the map. Move the red line until it moves to the left. 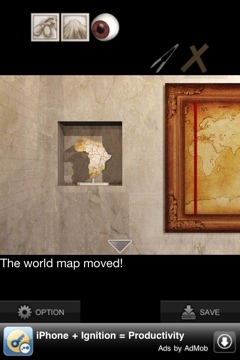 Then it will slide over, revealing a map piece. 10. Go back to the right bookshelf and make sure you read every book you can. There are five total. Now we can go upstairs. 11. Go to the phone and punch in “135” from the book on Japan. The first clock hand from downstairs has now fallen off. Go down and collect it. 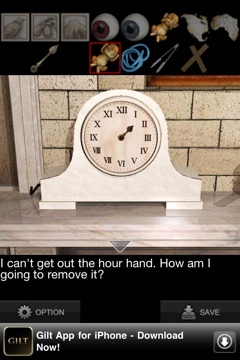 Make sure you also examine the hand that’s still on the clock or you won’t be able to use the phone again later. 13. 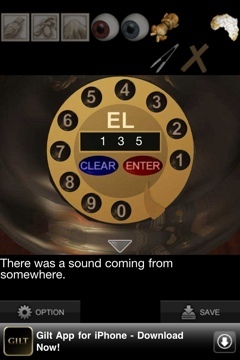 Go to the cabinet below the telephone and hit it with the tongs until it opens up. Take the hose. 15. 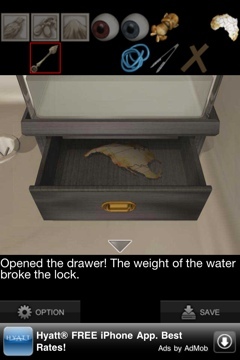 Take the second glass eye from the drawer below it. Put both eyes in the sockets of the bust. The panel will unlock so you can take out the “No See” monkey. 16. 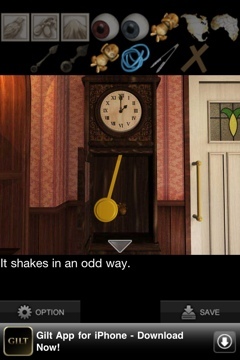 Open the door to the right of the grandfather clock. Go up to the sink. There’s a 5dl beaker and a 3dl beaker. You need to use these to get 4dl in one beaker to move them onto the scale. The way to do this is fill the 5dl with water. Pour it into the 3dl beaker. 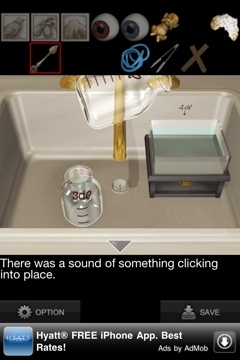 Then spill the 3dl beaker down the drain. Pour the 2dl left in the 5dl beaker into the 3dl beaker. Fill the 5dl beaker again and pour 1dl from it into the 3dl beaker. You should now have 4dl left in the 5dl beaker. Pour it on the scale and it unlocks. 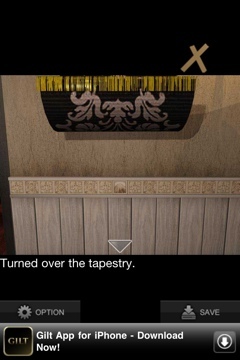 Take the second map piece from the drawer. 17. Leave the bathroom. 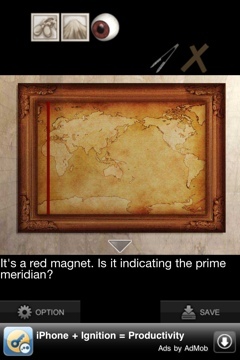 Put the two map pieces into the globe and it opens. Take the last money, “No Hear” and go back downstairs. 18. Open up the panel to the left of the brown door. Place the three monkeys in this order: See, Speak, Hear. 19. 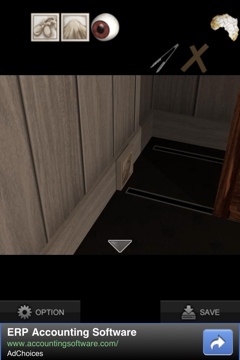 A keypad appears on the brown door. You can now go up to the bathroom and attach the hose to the bathtub faucet. Lead it out the window. Go downstairs and pull it in through the window using the tongs. It should now be leading into the glass bowl with beads. Go back up and turn on the bathtub faucet. 20. 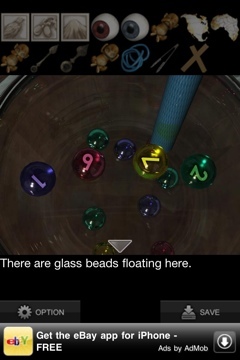 Four beads now float up to the surface of the water. They read 1972. 21. 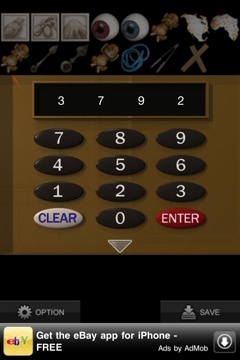 Use the hint “symmetry” with the keypad. 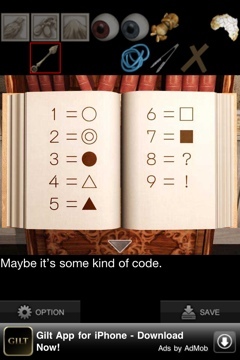 So 1 is 3, 9 is 7, 7 is 9, and 2 is 2. Enter 3792 into the keypad. 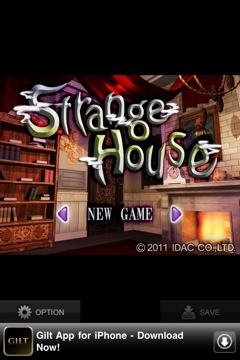 Strange House II (2) is out! See our walkthrough here. If you’re looking for more room escape games, check out The Lost City by Fire Maple Games, Escape Game: “The Meddling Shogi Player”, Antrim Escape 3, Atmosfear and these other escape games. 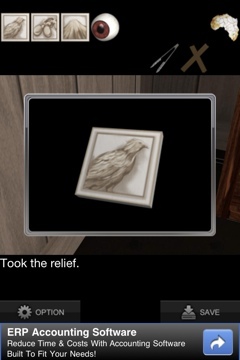 Previous PostEscape Game: “The Meddling Shogi Player”: A challenging, but ultimately satisfying room escape game. thanks, I found the answer above in the walk through. All I needed to know was to put 4 dl in the bottle, that’s got me on my way again. 🙂 Now why didn’t I think of that before? It’s the opposite of 1972 on the keypad. For instance, the opposite of 4 would be 6, but 5 would still be 5. 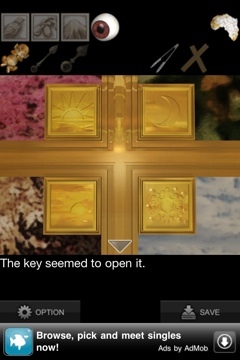 I’m having trouble combining the two keys to place them on the upstairs clock. Help please anyone. Open one and then use the other one on it. I can’t get them to combine either. What do you mean open on? I’ve tried everything to put them on the clock upstairs but it says they fall off immediately and won’t stick. Help me please!! You need to double-tap on one of them to see a close-up of it. Then use the other one on it. I opened the big hand, zoomed in on it and then tapped the small hand and it doesnt do anything? I even tried douple tapping the small hand and all it does is switch to that one? What am I doing wrong? Nevermind, i got it. I had to shut down and restart my game. Yay thank you so much. Don’t know why that was so hard lol. I am putting the monkeys in the right order but nothing happens… I “examined” them so I know which one is which but when i place them in the spots nothing happens to the door..
You can’t use the hose until near the very end. You need to get the clue for it first. What’s left in your bag? The order written above the slots is actually wrong. Try swapping the last two and see if it works. see – speak -hear !!!! i cant move the animals ! 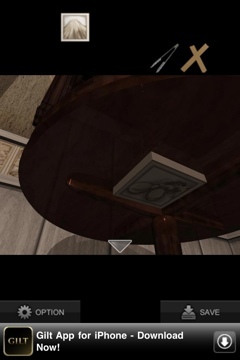 Make sure you zoom in on every animal as much as possible, as well as the engraving on the table. After collecting the minute hand on the clock, when I click on the hour hand, it just keeps saying it can’t get it out, I am not getting an equation, and so I cannot put the code in the phone. 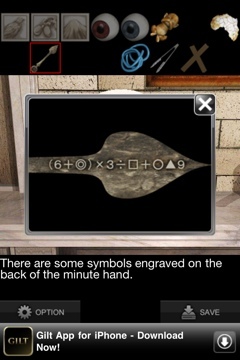 The equation is on the back of the hand that’s in your inventory. For some reason I can’t combine the clock hands. Help! 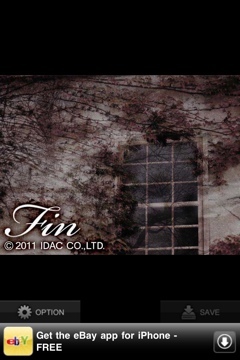 I just wanted to say the end is super creepy! I can’t find the blue string/wire. Where did you find it? 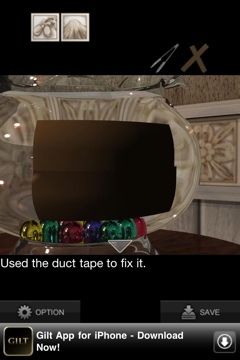 I don’t recall any string or wire in this game…? I can’t find the hose. 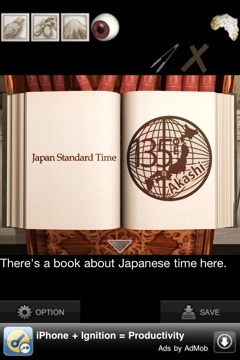 Where could I find it? What happent next?when I open the door? I know this is a stupid question, but how do u combine? Hoe do you combine items it wont work. I know right! im stuck at the clock cuz of that! 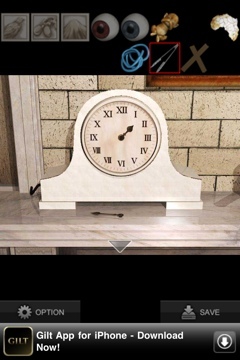 I dont understand how to combine the clock hands plz help!